Back and neck injuries from car accidents can range from spinal cord damage or a broken neck to soft-tissue damage and whiplash. These injuries are often painful, may limit mobility and may cause permanent impairment. You may be entitled to compensation if your back or neck injuries resulted from a car crash that was caused by another driver, by an auto defect, by poorly designed or maintained roads or by other types of negligence. 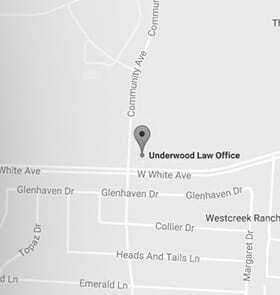 At Underwood Law Offices, we understand the problems you are dealing with. We are ready to investigate your car crash and the injuries it caused. We can help you secure the maximum compensation you deserve for your losses. Before you accept an insurance company’s settlement offer, talk to the experienced personal injury lawyers at Underwood Law Offices. We have the knowledge and hard-won experience to handle complex car accident cases like yours. Find out today how Underwood Law Office can help you. Call us or contact us online now for a free claim review. Paraplegia or quadriplegia (tetraplegia) due to spinal cord damage. Soft-tissue injuries such as whiplash. Broken bones, including compression fractures, lumbar fractures or fractures of the thoracic vertebrae. The law says car accident victims should be made whole, which means they should be compensated for medical bills, lost income, pain and suffering, emotional distress and other losses resulting from back or neck injuries. You can take legal action to obtain this money if you can show that another driver or another party was negligent and caused the accident. Negligence may be established by showing that the at-fault driver was unreasonably careless or violated the speed limit, DUI laws or other rules of the road. You will also need to prove that the negligence was the direct cause of the accident and your back or neck injuries. In some cases, legal action can also be taken against other parties in addition to or instead of the other driver. For example, you may be able to obtain compensation for back and neck injuries from the manufacturer of a defective car or defective parts, from the employer of a negligent driver or from the government agency responsible for road maintenance and design. What Should I Do if I Suffered a Back or Neck Injury in a Crash? It is important not to move someone who may have sustained a neck or a back injury in a crash as this may make the damage worse. If you think you may have suffered an injury to your back or neck, you may wish to wait for emergency personnel to come to the accident scene and safely remove you from the vehicle. Whenever you suspect a back or neck injury, you should get prompt medical treatment as soon as possible after the accident and ensure that careful records are kept. Whiplash and certain other types of back and neck injuries may not show symptoms for as long 24-48 hours after the accident. You should seek medical help immediately after any accident even if you are not showing outward symptoms of injury. You may be entitled to make a car accident injury claim to recover monetary damages for the back or neck injuries you suffered. Your case may settle out of court with the responsible party’s insurer agreeing to pay you a lump sum of money. You should not accept an insurance settlement until you know the full extent of your losses. It is best to have a qualified attorney review any insurance settlement offer. Insurance companies care about their profits. They often try to make a case go away with a quick, lowball offer. Don’t let them get away with it. Spinal cord damage is generally permanent, while other types of back and neck injuries can persist for lengthy periods of time and can cause significant pain and mobility limitations. Surgery may be required to correct your ailments, or you may simply rely on pain medication to cope with problems for which there is no cure. If no reasonable settlement agreement is possible, your claim may proceed to trial. You will need to prove to the judge or jury that the defendant should be held legally liable for the back and neck damage you experienced. At Underwood Law Offices, we have extensive experience representing clients who suffered many types of injuries to the back and neck. We want to help you recover the maximum compensation available to you under the law. Let a Back & Neck Injury Lawyer at Underwood Law Office help after your auto accident. We have handled many decades of personal injury cases. Our trial lawyers can help you recover the maximum compensation available in your back & neck injury case.